On behalf of "oppressed bugs everywhere", an inventive ant named Flik hires "warrior bugs" to defend his colony from a horde of greedy grasshoppers, led by Hopper. But when Flik's cavalry turns out to be a motley group of flea circus performers, the stage is set for comic confusion...as well as unlikely heroes! Featuring a star-studded voice cast, A Bug's Life presents an amazing new perspective on teamwork and determination - revealing subtle new details each time you watch it! 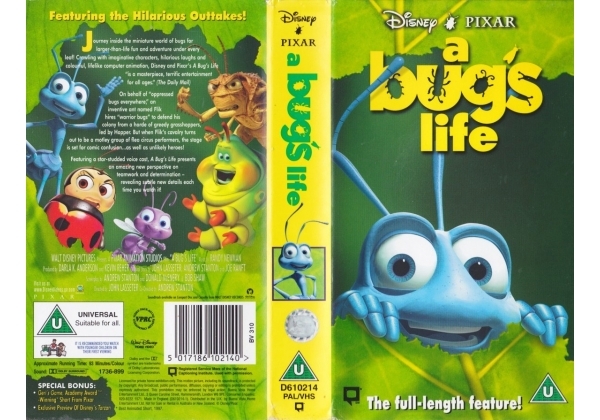 Or find "Bug's Life, A" on VHS and DVD / BluRay at Amazon.